Depicted above is a single cycle. The end of the recession phase connects to the beginning of the recovery phase to form the continuous wave pattern. As we begin, I want to give special thanks to our friend Dr. Glenn Mueller of the University of Denver for his thought leadership in this space. 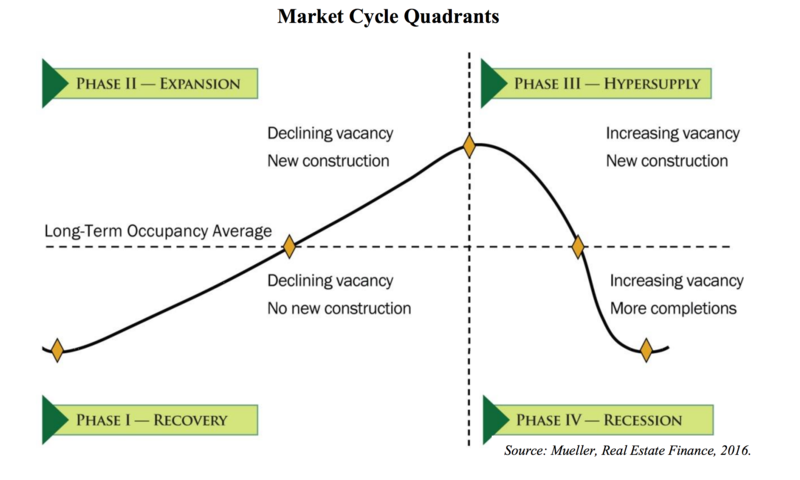 Any investor who wishes to do a deeper dive on real estate cycles is advised to check out Dr. Mueller’s outstanding work. Understanding the progression of each phase within the cycle is critical in being able to identify investment opportunities, as well as risks that can arise, with heightened sensitivity when phases are on the verge of transitioning. In this article, we describe each of the four phases and highlight certain appropriate investing strategies for each phase. The recovery phase is the bottom of the trough. Occupancies are likely at or near their low point with tepid demand for space and minimal leasing velocity. There is usually no new construction underway and rental rate growth is either still negative to flat or, later in the phase, possibly occurring, but at levels that are below the rate of inflation. Identifying the beginning of the recovery phase is difficult as the market still feels like it is in recession. OpportunisticOpportunistic real estate investments are the most high risk/high reward investment opportunities, requiring major development work. Opportunistic properties tend to need significant rehabilitation or are being built from the ground up. They have the chance to reach the highest rate of return for investors, but they little to no in-place cash flow at the time of acquisition and have the... More: Provided you move early in the phase, there are still opportunities to buy bargain-priced properties in varying states of distress and begin to reposition those assets as the recovery phase takes hold. Holding periods are often targeted at two to four years with a business plan that contemplates transitioning the subject acquisition out of its current state of distress and liquidating during the expansion phase once the property achieves a core-plusCore-plus commercial real estate investments are known as “growth and income” investments. The cash flow is less predictable, but they often predict a higher rate of return than core investments. The term "core plus" was originally defined as "core" plus leverage. Leverage is the use of borrowed capital to purchase and/or increase the potential return of an investment.... More to value-addProperties are considered value-add when they have management or operational problems, require some physical improvements and/or suffer from capital constraints. By making physical improvements to the asset that will allow it to command higher rents – remodeling the kitchens in multi-family, installing more energy efficient heating systems in a medical office, etc. – improve the quality of tenants and increase... More profile. Value-add: Value-add strategies during a recovery phase require careful thought and patience. For example, while pricing may provide for a great basis in a value-add asset during the early to mid portion of a recovery phase, the business plan should include contingencies for execution since strong lease up may not occur until the early part of the expansion phase. CoreCore commercial real estate investments are the least risky offering. They are often fully leased to quality tenets, have stabilized returns and require little to no major renovations. These properties are often in highly desirable locations in major markets and have long term leases in place with high credit tenants. These buildings are well-kept and require little to no improvements... More: Investing in core properties during the recovery phase can be a highly profitable strategy, particularly if the targeted asset has a significant amount of lease roll over the ensuing two to four years. 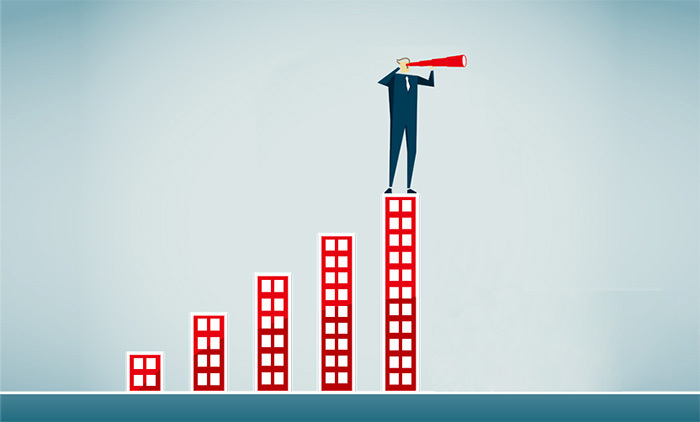 A typical strategy for a core asset in a recovery phase will be to acquire a trophy asset in a “main and main” location and then capitalize on the strong rental growth of the next cycle through a combination of lease renewals and lease up of any residual vacancy from the previous recession phase. The asset is then primely positioned to be refinanced or sold during the expansion phase. During the expansion phase, the market is on the upswing in terms of growing demand for space. From a macroeconomic perspective, GDP growth is back to normal levels and quarterly job growth is strong. Occupancy rates are improving and rents are on the rise. Rents now approach levels that can justify new construction, and in certain very tight markets, surge ahead at breakneck speeds. Development activity begins to return during the expansion phase. There also is a high point during the expansion phase – the crest of the wave – where supply and demand is in equilibrium. Development: This is the ideal time to develop or redevelop properties, because the current demand for space and leasing momentum helps properties stabilize more quickly upon delivery at rental rates that may set new market highs. Core-Plus: Investors who seek lower levels of risk can acquire Core-Plus properties knowing they will enjoy high rates of tenant retention with continued rent growth. Value-add: The expansion phase is prime time for value-add investing. Sophisticated investors can acquire properties with current deficiencies at substantial discounts to stabilized value, invest into capital expenditures and reposition assets rapidly aided by the strong absorption that is inherent to expansion phases of the cycle. Once repositioned, the asset can now command full stabilized value, which may translate into a refinance or sale. Opportunistic: While most opportunistic opportunities have disappeared by the expansion phase, it may still be possible to find the exception case where a capital starved asset remains in a state of distress. In that event, an opportunistic strategy during an expansion phase can be highly profitable but should accompany a short holding period unless the business plan is to refinance and hold post stabilization. The equilibrium between supply and demand in the expansion wave often tips over into excess. Oversupply of space can be caused by overbuilding, or a pullback in demand caused by a shift in the economy. Hypersupply is marked by rising vacancies. Rent growth may remain positive, but at declining levels. Core: Some investors may decide to sell assets ahead of they perceive as a coming decline in property values and more challenging leasing market. At the same time, other investors may concur on the macro perspective but instead of liquidity seek opportunities to take shelter from the coming storm. A core property with high occupancy and a rent roll chock full of credit tenants with average remaining lease terms in excess of five years is a prime example of a core property that will perform well through the downturn with lease roll that is optimally timed to occur during the next expansion phase. Opportunistic: At this phase in cycle, an opportunistic strategy may be more of a pricing strategy that can apply to any asset class rather than a typical distressed asset scenario. For example, once the hypersupply phase has set in, owners who are ill-equipped to operate through the impending recession, may hit the panic button and liquidate assets at prices that end up approaching recession price levels. In this scenario, the buyer leverages its capital superiority position to acquire a solid asset that he/she is confident will ultimately perform well in the next cycle with a recession phase already priced into the deal. Supply outweighs demand, which produces higher vacancies. Rent growth during recession is either negative or at levels that are below the rate of inflation. In addition, operators often resort to offering more concessions and rent reductions to entice and retain tenants. Opportunistic: This is an ideal time buy distressed assets at steep discounts to replacement cost. It is during the recession phase that buyers will also have the highest probability of acquiring assets in distressed scenarios such as special servicers and lender foreclosures, which are commonly referred to as real estate owned or “REOs”. This strategy focuses on absolute basis with a patient and well-capitalized business plan that, when the recovery phase emerges and the sun begins to shine again, the acquirer will then commence repositioning the asset with hopes of disposing of it during the end of the recovery phase or early expansion phase. Once you understand the four phases of the cycle it then becomes important to begin grasping variances of the four phases. First, phases do not necessarily occur in equal periods. The recovery phase may be brief and quickly transition to the expansion phase, or it may drag on for years. It’s also difficult to project the duration of expansion phases. In addition, cycles can have different total duration. Just because there was general consensus that a previous cycle was nine years doesn’t mean that the next cycle will approximate the same total duration. Second, cycles vary depending on geography and asset class. Certain markets, such as gateway markets, may lead the transition from recession to recovery phases of the next cycle with secondary and tertiary markets to follow suit. Also, different asset classes recover, expand, oversupply and decline at different rates with some of the rate variance attributable to the asset class itself and some of the variance attributable to location both at the metro level and within metros. For example, while overall, the office asset class may be in an expansion phase in a given market, suburban office assets may still be in recovery while urban office may be nearing hypersupply. Therefore, when applying the concept of the four phases of the real estate cycle to a specific asset you must also overlay geographic location and asset class to truly gain a sense of where that asset plots along the cycle wave. The differences that exist between market timing and performance at different stages of the real estate cycle speak to the importance of creating a diverse real estate investment portfolio to balance out the highs and lows in performance. To that point, CrowdStreet aims to provide a wide variety of real estate investment opportunities across property types and geographic markets.